Medela Freestyle Breast Pump – Why this pump is a MUST have! If you are not familiar with the Medela Freestyle breast pump, let me introduce you. This pump is in a league of its own – Lightweight, portable, exceptional performance, multiple settings, and technology to produce the most milk per session, and even has hands free connectors to make this the best pump on the market. Hands down. Honestly, all it is missing is a back massage and a manicure option. (Hey, a girl can dream.) I love the Freestyle and once you read about all its bells and whistles, I think you will too. My first pump, if I am being honest, was not the Medela Freestyle (I wish it had been). It was the Medela Pump in Style. I loved the Pump in Style and still recommend it but if you want to take your pumping experience to the next level, then the Freestyle is the way to go. When I was due with my second baby, I decided to look into a newer pump as mine was aging. I made a huge rookie mistake with my first pump and bought it used off my sister-in-law. I had no idea this was considered unsanitary since the Medela pumps are not a closed system (meaning the milk can potentially get into the motor since it is open to it through the tubing). I bought new tubing and attachments before using it but it is impossible to sanitize an open system pump completely. Always buy your pump new! They are single user products! Okay, now that the P.S.A. is out of the way, let’s get back to it – Since I was in the market for a new pump and I had heard such good things about it, I decided to splurge and go for the Freestyle (a new one of course). When it first arrived at my home (thanks, Amazon! ), I about went cross-eyed over all the attachments. Trying to figure out which thingamajig connects to which doohickey was like a science experiment. The attachments are different than the earlier models of the Medela pumps so I was not as familiar with them. Plus, I have a difficult time being told what to do, so I ignored the instructions which would have told me what part went where but that’s another story. In the end, I assembled my new Freestyle and I was ready to test it out! So What’s the Big-to-do with the Freestyle? Okay, let’s talk specs here. Weighing in at just under one pound, the Freestyle is extremely light weight and compact. It boasts a 3-hour rechargeable battery which is great for on-the-go moms. It features Medela’s two-phase expression technology which is an advanced pumping pattern that mimic how a baby nurses to optimize your time spent pumping and pull down the most milk. The two phases are Simulation and Expression mode. It will start out in the simulation mode which simulates your baby’s rapid sucking to start your milk flowing. The expression mode simulates your baby’s deeper suckling after a let down. There is a “let down” button you can press to switch to expression mode. 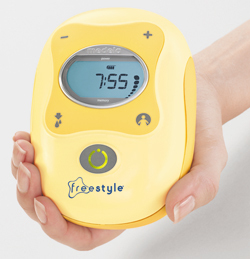 The digital screen on the Freestyle pump is backlit which is great for nighttime pumping sessions but it also features a timer and my favorite feature – the memory button. The memory button allows you to save your preferred pumping pattern so the pump will automatically switch from simulation to expression mode just when you like it to (ah-mazing!). 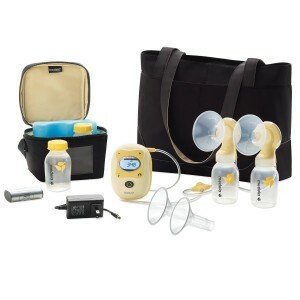 The Freestyle breast pump comes with 2 different size Personalfit breast shields (medium and large). Honestly, if you are looking for the best technology on the market, this is it. My first thoughts on the Freestyle were that I loved how small and portable it was. It literally fit into my purse. With my first baby, I carted around a huge tote bag with my Pump in Style and ice cooler inside which was ridiculously big. My favorite feature, however, has to be the memory setting. I love being able to control the suction and switch from simulation to expression modes and the fact that you can program the pump to remember your setting and how you prefer the pump to function. It’s genius. Is There Anything NOT to Like About the Freestyle? So what do I dislike about the Freestyle? Well, there is not a lot. If you read Amazon reviews, you will see several users reporting that their Pump in Style has stronger suction than the Freestyle. I wanted to test this out and see if it was true and honestly I disagree. The thing with the Pump in Style is that you use it mostly with a wall adapter meaning it is plugged into a power source. It has a battery pack but I did not use mine with just the battery pack because I felt it wasn’t as strong. With the Freestyle, it is portable so it has a rechargeable battery but can be used plugged in as well. I found that if you let the Freestyle get too low on battery power, then yes, it will not have as strong suction (just like the Pump in Style). I liked to recharge mine often throughout the day and perhaps that is why I did not notice the loss of suction. But I was able to pull down just as much milk with the Pump in Style as I was the Freestyle. I think the huge difference in the pumps is how portable and lightweight the Freestyle is and the added features like the digital screen and backlighting. As far as suction goes, the Freestyle and Pump in Style are neck and neck for me. But overall pumping experience, goes to the Freestyle without a doubt. Okay, I put this in here because I was so confused and overwhelmed trying to figure out the hands-free attachments that come with the Freestyle so I am betting you are too. Or, maybe not, but it will make me feel less dense if I show you how to use it. What in that heck do you do with all of that? What goes where? How does it go? And what do you do when it gets there? Well, let me save you some time and share this lovely little video that Medela was so kind to put together to show us how to use this little gem. It’s not as complicated as it looks. Now, I have to say that I did not love the hands-free attachment. It was somewhat of a pain to use and as you can see it has a number of parts. It’s not difficult to use, I just didn’t love it. I much prefer using a hands-free pumping bra or a nursing bra with the hands-free option built in. It is less awkward, quick, easy and requires no setup. But if you do use the Freestyle hands-free attachments, I do agree the result will be the same: hands-free pumping. Check out my favorite hands-free bra options here! The Freestyle is, in my opinion, Medela’s best breast pump but it is also the most expensive. I am typically a bargain hunter but in all honesty, when it comes to a breast pump, it is best not to go cheap. But it also depends on how often you plan to use your breast pump. If you will be pumping every so often and just want a fast and efficient pump while having no regard for sticker price, then by all means, get the Freestyle. But really this pump is intended for moms who will be using it daily. It is not cheap but I wouldn’t dare go cheap on an item I rely on daily to do something as important as feed my child. Trust me, when you pump daily, this is not the time to buy sub-par brands just because they cost less. It will cost you more in the long run when you have to go out and buy a better pump because your supply is tanking. So How much is the Freestyle and where can you buy it? The suggested retail price of the Medela Freestyle breast pump is $379.99. I honestly have not been able to find a better price than the one listed above. If I do, I will be sure to update the information here. Well, there you have it. The best compact breast pump on the market. You won’t be disappointed. Have questions about the Freestyle? Used the Freestyle before? Leave a comment and let us know how we can help or what you love about the Freestyle! Click here to read more about the Medela Freestyle Breast Pump! Medela Freestyle Breast Pump – Amazon! 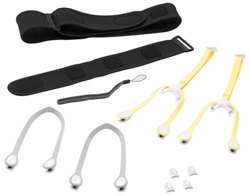 Read: Need Supplies for Your Medela Freestyle? Or Milk Storage Bottles and Accessories? Get Them Here! 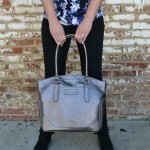 Read: Check Out This Stylish Bag for Your Pump! Read: Best Hands-Free Pumping Bras! See What You Have Been Missing!